So you all remember my five new year's goals? Well, if you don't, just know that one of them was to cook a new recipe every week. It is now March, and this week was the first time I did. Oops. But I think I made up for these failings by making three (soon to be five) new recipes using The Everygirl's 5 Recipes (10 meals) for Under $50 guide! Last week, our contributing food editor, Lara Matos, came up with five tasty recipes that are as easy to make as they are delicious. And since I spend a ridiculous amount of money on take-out and dining in restaurants, I thought I'd accept the challenge in hope of saving a few dolla bills. 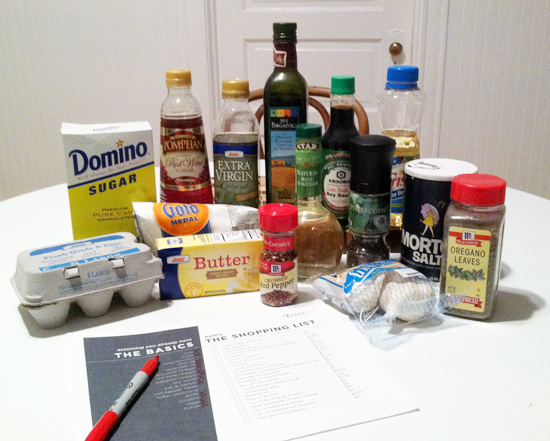 So Sunday night, I gathered together all the items I had on Lara's list of basics (foods you should always have on hand in the kitchen, things like flour, sugar, olive oil, etc). I am happy to say the only item I was missing was Italian seasoning. Shocking, considering I never cook. Go me! So I went home, feeling pretty good, and got to work on what has still turned out to be my favorite of the three recipes I've tackled so far. 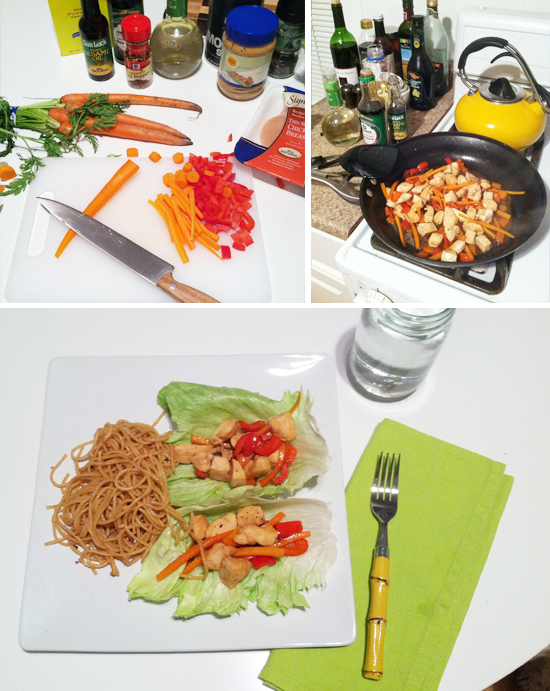 Lettuce chicken wraps and peanut noodles. Oh. My. Gawd. Delish. I never in my wildest dreams imagined I could whip up any type of Asian cuisine, but turns out, it's not so difficult with the right ingredients. Part of the problem may have been that it was my first time down the "Kosher/Asian/Mexican ingredients aisle" at the grocery store. I found it... invigorating. Like discovering a whole new world. Monday night was "fancy mac and cheese." See that photo on the top right? That's goat cheese, my friends. Pure love in the form of goat cheese. My friend said, and I quote, "This is so good it's almost restaurant quality." Step aside, Giada. There's a new cook in town. 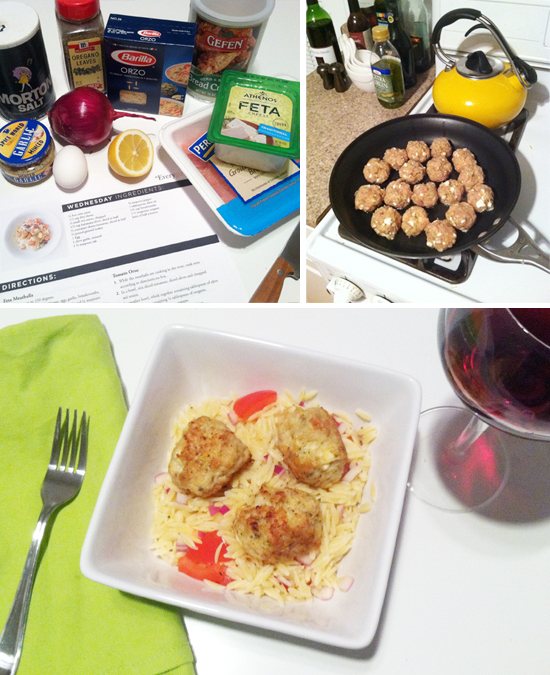 Tuesday I tackled the feta and turkey meatballs, which came out scrumdiddiliumptious even if they were a little dry. I definitely added too much onion to the orzo, but my roommate and I lapped this up anyway. 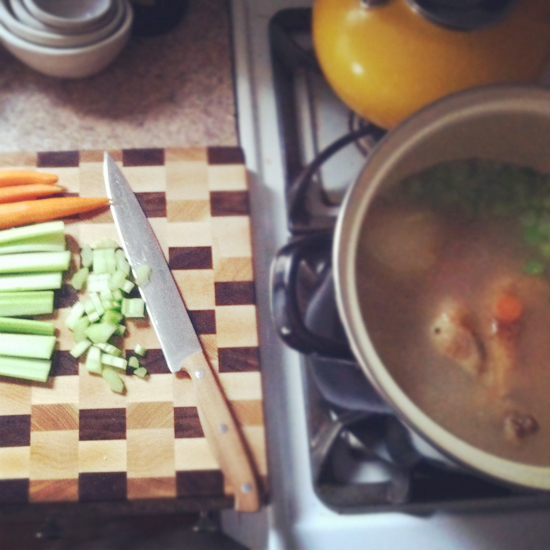 Wednesday I got off track from the recipe list and instead made a pot of my mom's chicken noodle soup for the boy who came back from a business trip very sick. I find homemade soup cures all. Tonight I'll be attempting the chicken and artichoke flatbread, and tomorrow is eggplant sandwiches. I'll report back via Twitter, so make sure to follow along. On a final note, I have to say, I couldn't (or wouldn't) have done this had it not been for my new knife set from West Elm. 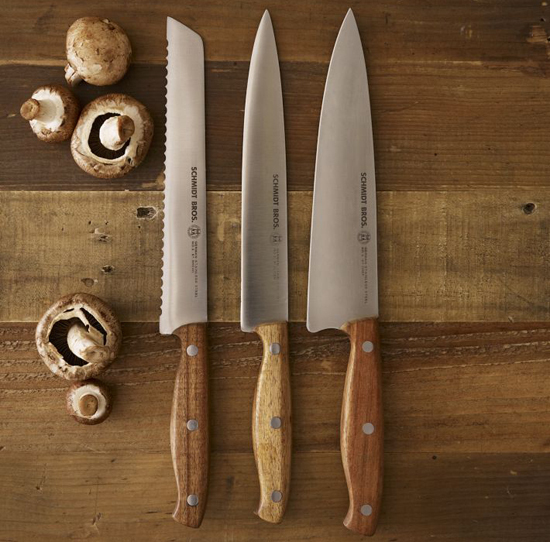 Their basic set includes a chef's knife, slicer, and bread knife, and is currently on sale for $41! You can't beat that for a set of quality Schmidt Bros. cutlery. So that's that! I encourage anyone looking to delve into the magical (albeit intimidating) world of cooking to take a stab at some of these recipes. Or cannonball right in, and do what I did, purchasing the entire list and making all five! Let me know how it goes! Have any of you tried these recipes? Which was your favorite? I made the turkey meatballs yesterday and drooooooled. SO good. hahaha you crack me up. you go girl. Hoping to try some of these next week after i hit the store! The fancy mac looks sooo good! I challenged myself a few months ago to cook everything I pinned to my recipe boards on pinterest. I'm happy to say I've made about half of them so far. It's been fun! Sure I keep adding more but I have no deadline in mind so no biggie! I've made four of the five, with the lettuce cups to go tonight. They've all been really delicious and quick to make. I hope you guys repeat this idea on the site more - It's definitely my favorite feature thus far! I like making turkey meatballs. They're good just on their own or in so many other dishes. I need to head over to Everygirl and print out that list! Have a great weekend. 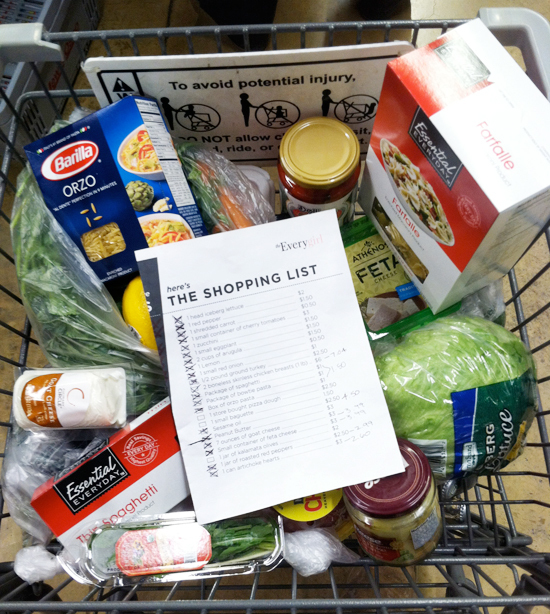 I've found that going food shopping with a shopping list that I've made from meal planning always saves me money. That way I'm not buying things just because it's on sale or "just because" but actually with a purpose. Another plus is that you're not wasting food and in turn, money. I love to cook and I hope you're developing a new love for cooking! The food looks great! Alaina, those dinners look AMAZING! I have a serious love for goat cheese. I have to try that recipe. I have been making the recipes througout the week as well! You're right, the Asian lettuce wraps and peanut noodles are the best so far! All of the recipes are great, but this one was shockingly good. 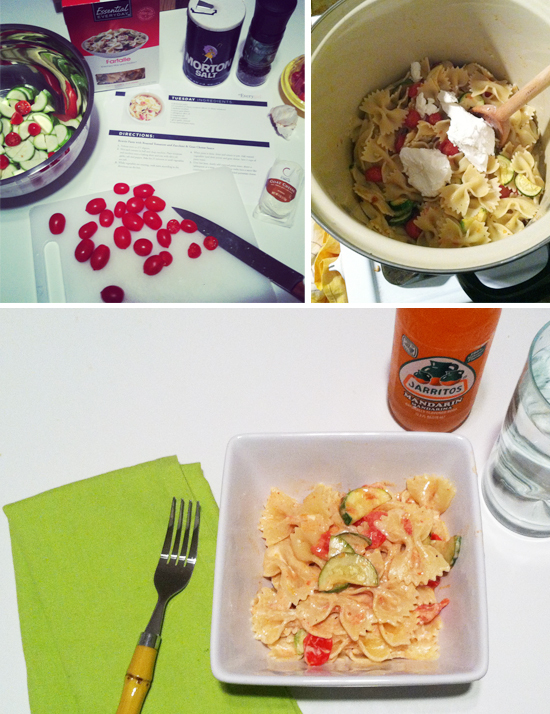 It was so good in fact that I made more the same night to take for lunch the next day. LOVE these meals and I hope that you guys continue adding new recipes at similar price points! Where can I find Lara's list of basics? I've made some of these this week and LOVED them! The lettuce wraps were amazing and definitely my favorite. I just wish my kids like them. :-( I think they'll like the pasta tonight, though. Thanks!